The year is 2088. Star Control has finally been formed years after the Lexites have left Earth to explore beyond the stars. After something mysterious crashes on a nearby moon, you’re sent to investigate. There, you find a marooned ship from an alien race called the Tywom that have been watching your species for some time. Fortunately, they come in peace. However, you soon learn about the Scryve, who certainly do not come in peace. And worse of all, they’re looking for you, human. You are the commander of the Flagship of Star Control. As commander, you’re tasked with exploring the universe, collecting resources from planets and moons, communicating with other species, and fighting said species if it comes down to it. Your roles sound simple, but so could nuclear physics if you explain it the right way. In the prologue, you’re greeted with a fetch-quest that serves as the game’s tutorial, but this doesn’t last long, and by the time it’s over, you’ve mastered how to control the ship and gotten your feet wet with fleet battles. The ship is controlled via tank controls, and using fuel, you propel your crew forward through space. When you come across a planet or its moon, it’s “scanned” and you’re given an overview of its climate, the materials on the surface, gravity, hazards such as heat or toxicity, and an indication on if there is an unidentified object on the surface. Exploring a planet or moon has two phases. The first is the actual landing phase. Here, there are several rings that your lander must follow in order to land properly. Even if you go outside the rings, it’s okay, as long as you land in the green landing section. If you fail to land in this section, the lander will explode. This isn’t the end of the world as you can replace them, but it is the end of those five crew members’ lives. Fortunately, they can also be replaced. The second part of exploration is a third-person camera style drive around the round surface of the planet. Around here are several materials that can be picked up, but there is a limit to how many you can carry, meaning you’ll have to make some choices on what not to bring, or make a second trip. Occasionally, there will be animal life and killer drones on the planets. The drones, of course, can destroy your lander, but that’s where the cannons come in. Early on, you can find a module for your ship that allows your landers to shoot laser beams while on the surface. This is exactly what the lander needed, because it’s satisfying to blast away rocks to find rarer materials not listed such as gold, or take out the drones from behind without being seen first. The unidentified objects vary in usefulness. Several of these objects are quest items, ruins, artifacts, or crashed ships. The ships can be taken back to Star Control and fixed up to become a part of your fleet. There are a few ruins that cause disappointment. In one instance, I came across a zombie filled section of ruins. Of course, this was all told to me by one of my crew members in an amusing fashion, but there wasn’t any benefit to finding it besides a good chuckle that I’m aware of. Some of the artifacts, however, give lore to the game. In your solar system, you can come across a ship that the Lexites left behind. If you have a certain material, you can power the ship up and make it part of your fleet. Earlier on, you can find out more about the lexites and earn the canon mentioned previously. And these are just what you can find in your solar system. The real game begins once you’re given the hyperdrive module to get outside your solar system. The universe opens up to you, and you can can see what alien race owns what solar system. In a way, it looks like a 4X game with how the aliens are accompanying sectors as you’re playing. It’s a living, breathing universe, and there’s nothing you can do to stop the spread of the Scryve from the uppermost point of the map. But, the Scryve and the Tywom aren’t the only alien races you encounter. Your main goal is to deal with the Scryve before they take you out, remember? This all unfolds while you’re helping various races solve their own problems. For example, the Mu’kay race are aquatic beings that travel from planet to planet in search of tasty fish to eat. Of course, despite needing the nutrients to survive, they also hate these fish. They’re under rule of the Scryve empire, but they have their own Federation comprised of one member: them, and they want peaceful solutions at all costs. On the other hand, you have the Drenkend, who are a violent race made for one violent purpose: follow the Scryve’s lead and destroy anyone deemed a threat. They also have been instructed with taking out anyone that doesn’t have three ears, when they are clearly wearing a fake ear themselves. This leads to various hilarious conversations, all before a tough ship battle. If you end up seeing these guys early, it’ll lead to certain doom and you’ll have to revert back a few autosave points if you aren’t saving like a madman. And these are just a few of the large handful of races populating the universe of Star Control: Origins. Interacting with these races is easily one of the highlights of the game. Most of the interactions you have are fully voiced over, and not a single one of these encounters feels cheesy. With respectable stars such as Firefly’s Adam Baldwin lending a voice to this universe, Stardock have outdone themselves with a fitting cast for a fitting script. Star Control: Origins knows how to have the perfect mix of serious and silly. At its best, it doesn’t take itself too seriously. The aforementioned Drenkend are silly, and I actually feel bad destroying their ships, especially since I now know that the “bullets” they are firing are actually just cloning pods full of, uh, clones. It was easy to feel like I was bonding with these characters because of how charming they were and how Stardock was able to sprinkle just enough backstory to both inform me and leave me wanting more. On the flip side, the foreboding warnings about the Scryve getting closer to discovering the Earth and learning about how they treat other races is intimidating. While I was exploring different solar systems and going on odd quests for various species around the stars, I always had a sense of urgency in the back of my mind. Eventually, I’ll have to take care of the Scryve problem, and eventually I’ll have to learn about the Lexites. But that only made me want to dive into the game more. It wasn’t a 4X game, but it is as addicting as one. Finding the story at my own pace allowed me to grind for materials to upgrade my ship, or dare to fly as far as my ship can take me, only to be rescued by a Tywom going in great deal about their fanfiction as a punishment for running out of fuel. During every movement I make, the universe continues to move without me. Different species take over different sectors. Ships come and go into solar systems, be it to pass me by or take me out. Best of all, the game is even taking into account the choices I’m making, but every change feels organic. All this, and I haven’t even talked about Fleet Battles yet. When you encounter a malicious ship, the fleet battle is simple. You select one of the ships in your fleet to send into the arena. 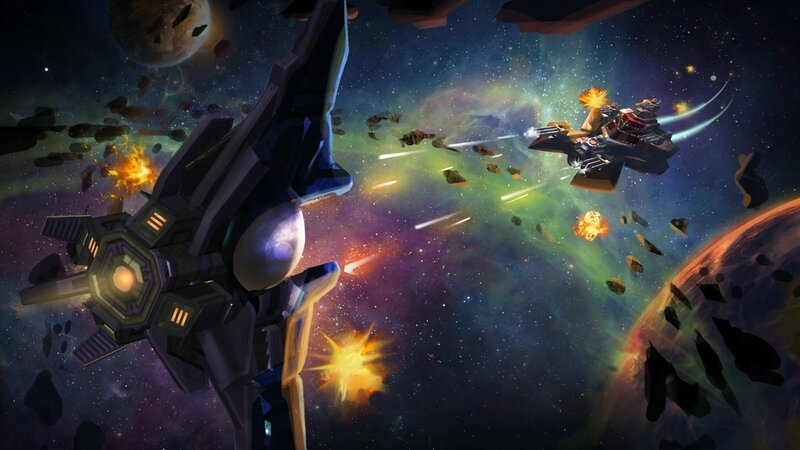 They then engage in a 1v1 space battle, with each ship usually equipped with two abilities. For example, the Tywom ship has a short range beam that causes a moderate amount of damage. But they will have a culture of pods popping up around them. When you press the secondary attack button, these pods will be stationed in that location and fire at any threats that approach. My favorite strategy with this vessel was to collect a mass of these pods, station them close together, and bait the ship into the field-of-death. Fleet Battles are hard to get used to, but satisfying when you grasp the basics and understand what your ship can do. Stardock realized that Fleet Battles is a fun mode, and they decided to make it its own mode for two players (or two computer players, if you want) to duke it out in. Each side chooses their fleets, with each ship having a certain amount of points. If you were to use the smaller ships that self destruct, you will spend less points and can therefore have a larger fleet. But some of the Scryve ships, such as the one that shoots a massive laser, take up more points. It’s fun to experiment with the different combinations of fleets, and the possibilities are close to endless thanks to crafting. When the main story is concluded in Star Control: Origins, that’s not necessarily the end of the game. The universe will continue to exist, and the players can even make their own ships, buildings, and later on, planets and stories, with an incredibly in-depth crafting system. This will lengthen the lifespan of Star Control: Origins greatly, and players can even upload their creations to the Steam Workshop, no matter how much of a monstrosity their creation might end up becoming. To say that Star Control: Origins left a huge impression on me would be an understatement. I went into the game liking it after my experience with the E3 demonstration and the preview, but I fell in love with it when I finally got to dive into the meat of its universe. The aliens I encounter are endearing, including the “bad ones,” and the fleet battles are the cherry on top of a wonderful experience. If you’re looking for space exploration with a brilliant script and as many story-progression possibilities as there are stars in the sky, Star Control: Origins can scratch that itch. Star Control: Origins successfully grasps the perfect balance of serious and silly while making an engaging universe that’s fun to explore. The voice acting is wonderful, the script is brilliant, and the fleet battles are short, sweet, and exciting. With an in-depth crafting system, a living universe, and a multitude of choices that subtly affect the story, Star Control: Origins soars. Sean Anthony likes to combine two of his passions: gaming and writing. Gaming has been a huge part of his life ever since he played his first game as a child, Kirby's Adventure. He aspires to have his name attached to an article that makes the whole world go, "Huh, that's neat, I guess."